What Is a True Vogel Crystal? Named for Marcel Vogel, the name "Vogel crystal" is used very loosely in today’s market place. Many, if not most, "Vogel crystals" are imitations. 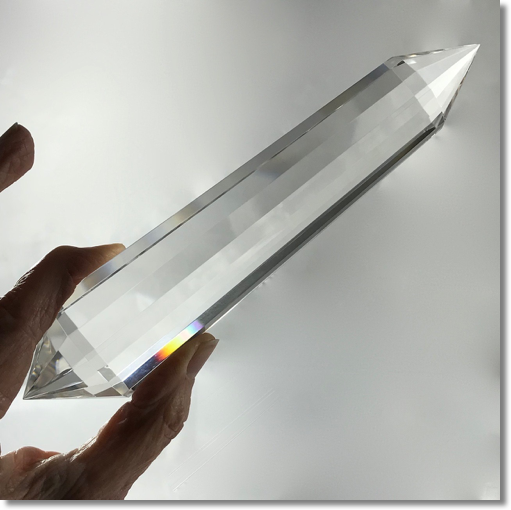 Once you've held an authentic Vogel cut crystal in your hand, you’ll know the power of these precision cut crystal healing tools. 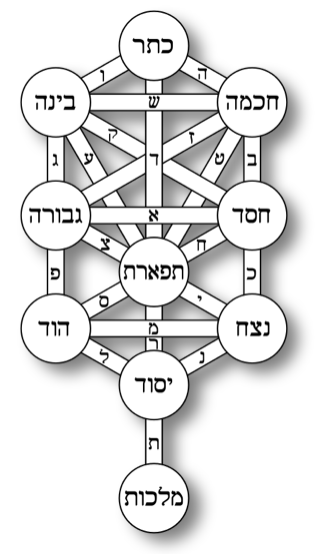 The specific cuts of a Vogel crystal enable a spiraling energy that can create the movement of small doses of natural radiation delivered to human body through heat, light and vibration. This delivery can be to yourself, to another person, or across the globe. Named after Marcel Vogel, a true Vogel Crystal Wand cut follows Marcel's specific instructions and guidance. There are a variety of different shapes of cut quartz crystal. Many quartz crystal cut styles are intended to maximize the beauty and the light-reflecting qualities of the quartz crystal material. Some crystals are faceted for scientific and commercial applications such as laser technology. And some crystals are intentionally cut as energy healing tools. 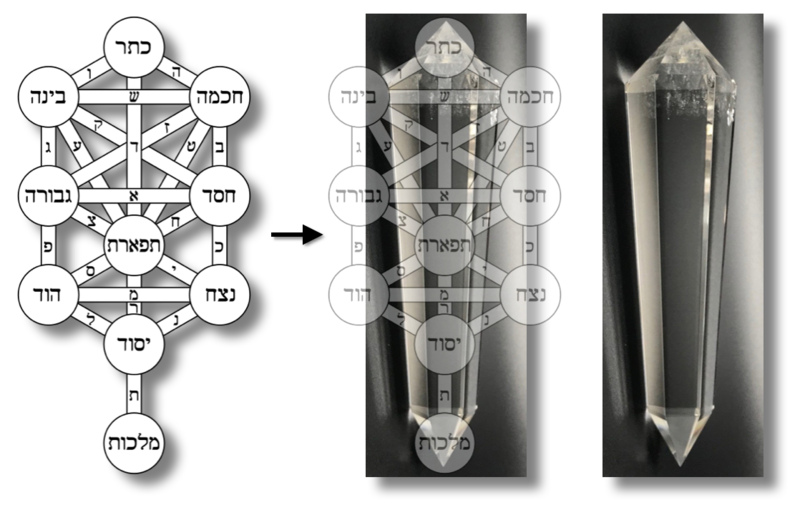 The purpose of a Vogel crystal is to amplify and cohere (gather) the thought and energy that you desire to focus into your body/mind or that of another person. Amplification we can understand, but coherence is a more obscure concept in physics terms. To simplify, when applied to the physics of light, coherence is the condensing of the light wave/particles into ultimately a laser beam. In other words, if you take ordinary light and condense it or make it coherent, you end up with is a laser beam. We know that crystals can amplify information. 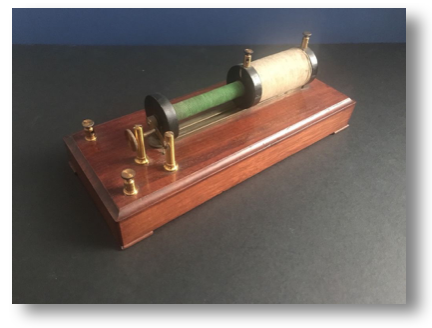 Early radios were based upon crystal technology and were often called “crystal sets”. As demonstrated by a 1974 experiment in digital holographic storage systems at Stanford University, crystal structures can store and retrieve digital information: "Stanford University physicists have demonstrated the first fully digital model of such a device, storing and retrieving the Mona Lisa." 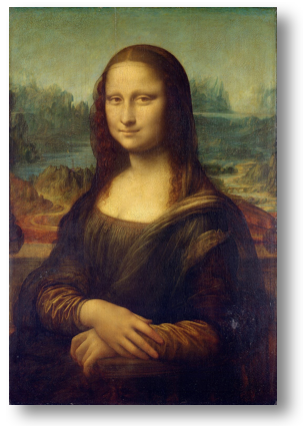 A digital image of the Mona Lisa was stored and retrieved in a crystal structure proving the information storing capabilities of crystal material. Marcel Vogel’s research into luminescence and liquid crystal technology had led him to understand that quartz crystals can store, amplify, and transfer three-dimensional information. As he continued his research, Marcel very soon found the limitations of natural quartz. While it could store and retrieve information, it did not cohere and amplify the energies emitted by the body and mind of a living being. Because of this limitation, Marcel began an exploration into faceting as a way of concentrating or cohering and amplifying a crystals power. And then he experienced a vision upon waking from his sleep. Marcel Vogel's vision led him to develop the specific shape and cutting angles that intensify coherence and amplification of a crystal's energy. The vision of sacred geometry led to the development of crystal cutting that combines the healing properties of the crystal with the ability to create intentional healing. As Marcel Vogel described, a properly cut crystal will take in energy at the receptive end and amplify it as it circulates around the inside of the crystal's walls. The energy hits the internal sides of the polished facets as it revolves and then is transmitted from the focal end. Marcel Vogel described a true, authentic “Vogel-cut crystal” must be cut to comply with his research and teachings. 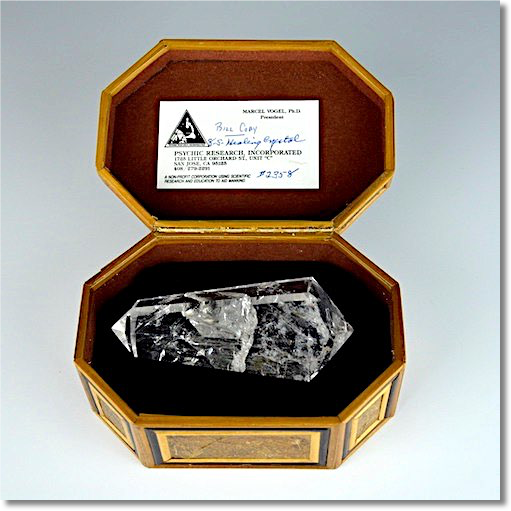 A Vogel Crystal is cut to exact specifications and with the appropriate care necessary to assure the Universal Life Force is attracted, amplified, and transmitted properly. Click here to see our crystal healing wands. cut to 456HZ to attune to the vibrational freqency of water. A true Vogel crystal’s receptive end, sometimes called the female end of the crystal, must be faceted forming an internal angle of 51 degrees, 51 minutes, and 51 seconds. This is the same angle as the sides of the Great Pyramid at Giza. The transmitter end, sometimes referred to as the male end of the crystal, must be faceted with a more acute internal angle than the receptive end. 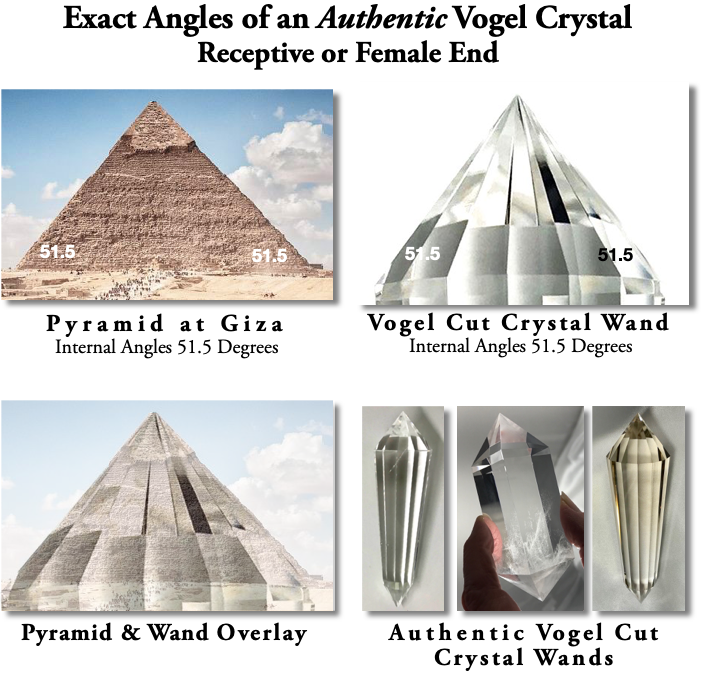 An authentic Vogel crystal's receptive or female end forms an internal angle of 51 degrees, 51 minutes, and 51 seconds, the same angle as the Great Pyramid at Giza. The only crystals considered a true Vogel-cut have 4, 6, 8, 10, 12, 13, and 24 facets. Most crystals cut with twenty-four sides and more are machine cut due to the extreme difficulty of maintaining symmetry. Crystal cutters trained in the art of making these exacting Vogel hand cuts are a vanishing breed. Cutters that Marcel trained have made their mark in the world by taking his cutting technology to the next level. The Vogel cutters have used their skills to develop unique designs like the Angel Cut, Vision Quest, Unconditional Love, and others that would be considered ‘Vogel inspired’ or ‘Vogel style’. Please be aware of imitation Vogel crystals. We invite you to compare the inexpensive imitations to a true Vogel crystal. Owning an authentic Vogel healing crystal is an experience of a lifetime. We carry only the finest quality, authentically cut and designed Vogel crystals handcrafted with intention by master lapidary artists. We’re happy to help guide you in learning more about true Vogel cut crystals. We can ensure that you select the healing tool that will support your intentions and empowerment. Contact us today to start your healing journey! REMINDER: We offer a 100% Satisfaction Guarantee. If you don’t connect with your new crystal healing tool, just contact us as within 7 days or receipt for full refund or 21 days for store credit. We'll make every effort to help you select the crystal that will best suit you and your intentions. -Marcel also stated “The principle of life is the soul, without it, there is only matter that decays. The soul attaches consciousness to matter, imprinting consciousness energy to physical matter. Love is the primary unit of life, hate is the primary negative unit of life”.